PRI is currently supporting our local NGO partner, the Foundation for Human Rights Initiative (FHRI) to conduct research into the needs and characteristics of women prisoners in Uganda. Over 100 women prisoners have been interviewed so far with initial findings showing that many are imprisoned far away from their homes and children, receiving few or no visitors. Many have experienced sexual or violent abuse, and this is linked to the many convictions of manslaughter. Here, Diva Mukisa, Project Coordinator and Denis Angeri, Project Assistant at FHRI report on the research project and on some significant findings so far. 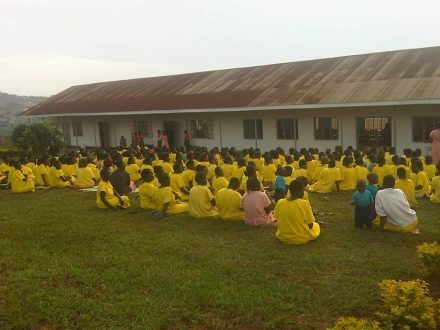 Luzira women’s prison is one of the prisons that houses female offenders in Uganda. The prison is located a few kilometres away from Kampala city centre, off Luzira road, and houses over 38% of the total prison female population in the country. Most of the detainees held there are either convicted or charged with capital offences and will have to spend the greater part of their lives in the prison system. Upon receiving clearance to enter the premises and permission to interact with the inmates, we are greeted by a group of smiling, yellow uniform clad female inmates who call this rather imposing establishment home. The buildings, even though old fashioned, are well maintained and – coupled with a fairly clean environment – are without the sense of gloom and intimidation that a first time visitor may have envisioned. But behind these smiling faces lies a great deal of untold loneliness and feelings of abandonment and dejection that can only be discerned if you take the time to ask. A number of these prisoners have been transferred from districts far away from Kampala which implies that many of them will not be visited by their friends and families whether as a result of the long costly distance to be travelled to the prison, the stigma associated with the grave offences committed, or even just because they have never had the opportunity to tell their relatives where they are. Many of these women are hit with bouts of loneliness, sadness and depression brought about by the fact that they have not had any contact with their family, children, and loved ones. The few who have visitors are not frequently visited as the visitors often have to travel a long way. Spouses who initially make an attempt to visit are eventually disillusioned and finally give up visiting, moving on with their lives and starting new families. Earlier this year, the Foundation for Human Rights Initiative (FHRI) together with Penal Reform International (PRI) embarked on research into the characteristics of female offenders in Uganda. The study was inspired by the United Nations Rules for the Treatment of Women prisoners and Non-custodial Measures for Women Offenders (the ‘Bangkok Rules’) which were adopted by the UN General Assembly in December 2010. The Rules recognise that there is limited knowledge on the background of female offenders and how imprisonment affects them and their children. A large majority of prisoners in Uganda have a child or children outside of prison, and they have great social and emotional need for regular contact with their children, and their children with them. Many a time the women are the sole caregivers for their children and when they are imprisoned the future of their children is left to fate. For such women it is important to have access to the outside world to know the whereabouts of their children. The Bangkok Rules encourage that women prisoners have regular contact with their families including their children and their children’s caregivers. However in a country where about 20% of people live below poverty line, visiting a relative in prison does not rank high in the list of priorities, especially when the high travel costs may further impact negatively on their livelihoods. Preliminary findings from the research show that a number of the prisoners interviewed have not been visited by their family with most of them barely knowing where their children live and constantly worrying about their children’s well-being. Very little attention has been given to women in prison and their special needs in the past mainly because they are a minority. They often come from deprived backgrounds and have a history of physical and emotional abuse, domestic violence and disease. And even though our results show large number of women are there for capital offences, a considerable proportion of women offenders do not necessarily pose a threat to society. Some of them are first-time offenders who acted out of passion, anger, jealousy and much as they should serve their sentences, it is important that they are understood and supported to become better and more productive people to their families and society. Once the research is completed, PRI and FHRI will discuss the findings with government officials and other stakeholders to identify priority areas where women offenders will benefit most from changes to law, policy and practice, and provide training and expertise for these changes to take place. The research follows the same methodology as we have used in our South Caucasus, MENA and Central Asia regions and will provide a valuable addition to the research reports and data gathered to date. Update! Who are women prisoners? Survey results from Uganda is now published. This is absolutely brilliant work. I would love to get involved if it is at all possible. I have some ideas about one way in which we can help these women. However, the idea is still in its infancy stage. I would love to chat you about this and get your input.